Beware of yellow jackets. These yellow-and-brown-striped stinging insects may look like bees, but they are actually dangerous wasps whose aggressive behavior can ruin outdoor events. For reasons scientists have yet to understand, yellow jackets become increasingly aggressive as summer draws to a close. Often stinging without provocation, these wasps can pose a serious stinging danger to employees and customers during end-of-summer outdoor events. 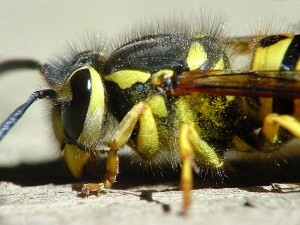 Like other wasps, yellow jackets have straight stingers which means they can sting their victims multiple times. When agitated, they stream from their nests in large numbers, swarming around and attacking their victim. Multiple stings can be dangerous and may be fatal, even to people who are not allergic to yellow jacket stings. Yellow jackets build their nests in some surprising places. Aerial nests that look like large gray footballs hanging from tree limbs are typical; but these wasps will also colonize abandoned animal burrows and build nests between evergreen boughs. Their attraction to food scraps and sugary drinks brings yellow jackets into frequent contact with people during the summer months. They can usually be found buzzing around outdoor trash containers, picnic tables and barbeques or food courts at outdoor events. Eliminating yellow jackets is a job for well-trained and experienced NYC and NJ pest control professionals. Don’t place yourself, your family, your customers or your employees at risk. 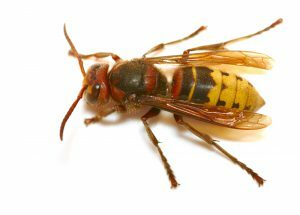 Call Stern Environmental for safe wasp removal. Check out the video clip in today’s Facebook post of the massive (6-ft. X 8-ft.) yellow jacket hive found in Florida. It doesn’t take much imagination to figure out what would happen if you stumbled on such a large hive of angry yellow jackets. 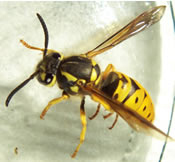 A type of wasp, yellow jackets have straight stingers which means they can sting multiple times. A swarm of these extremely aggressive stinging insects can kill even if you are not allergic to their venom. Yellow jackets are responsible for most of the life-threatening bee and wasp attacks in the U.S.
Luckily for us, New Jersey winters are too chilly for wasps to overwinter which limits the size of their hives. With the exception of the queen, wasps die when cold weather hits. In the spring, the queen emerges from her underground lair to populate a new colony. Unlike bees which typically feed on nectar, wasps are predatory carnivores that feed primarily on other insects, but will also eat carrion, fruit and plant nectar. The most aggressive stinging insect in the New York City and northern New Jersey areas, yellow jackets become increasingly aggressive as the summer moves into fall, often attacking without provocation. If you find a yellow jacket hive on your property, don’t put yourself at risk. Call the bee and wasp control experts at Stern Environmental. As the springtime approaches, many pests that have been off of our radar throughout the frigid months will suddenly make their presence known once again. Like a light switch being turned on, creepy crawling bugs, knife-stabbing mosquitos, oodles of ants, and the never ending fly-by’s of the aggressive yellow jackets will make you wonder why you wished for spring in the first place! With the anticipation of the upcoming spring, summer and autumn pest’s arrival, yellow jackets, hornets, and bees are ones that many people tend to worry about. New Jersey pest control professionals are often called to homes and businesses to remove yellow jacket nests. Unlike the docile honey bee, yellow jackets are indeed the most aggressive wasp that you will encounter. Yellow jacket nests begin in the springtime with a single wasp, the queen. She becomes active when the weather becomes warm enough for her survival. Emerging from her nest in the late months of winter or early months of spring, the hungry queen will feed and then begin her new nest. Yellow jackets are considered to be beneficial creatures, and predators, because they kill large numbers of nuisance flies and plant-feeding insects. During the early months the larvae requires a large amount of protein in order to survive. By the summertime, to maintain the developing larvae and queen, sweets are collected by the foraging workers. New Jersey pest control experts find yellow jacket nests deep in abandoned rodent burrows or within buildings. Indoors, wall voids, ceilings, and attics are favorable nesting sites for yellow jackets. Besides being aggressive, yellow jacket colonies will become quite large each season. Depending upon the species of yellow jackets, colonies can range in size from between 1,500 to 15,000 per season! You can keep yellow jackets from harassing your family or business in New York or New Jersey by calling Stern Environmental Group.